Happy Saint Patrick’s Day! Let’s celebrate with some green Italian food! Err never mind. That just doesn’t sound right. I’m slacking over here and I know it. I’ve been a bad food blogger, and just bad in general. You see, I have a one track mind right now and it’s not food for once. It’s been unusually warm here this winter and as Queen sings, “I want to ride my bicycle. I want to ride my bike.” I can hardly get off the darn thing and my backside is completely saddle sore. Oh, you probably didn’t want to know that. I’ll leave you with this recipe I threw together last night. It’s simple and fresh, which fits well right now. I’ll be back in the kitchen and back on the blog as soon as I stop acting like a 10-year-old. This recipe makes enough sauce for two somewhat small packages of ravioli. Freeze half of the sauce for later if you're making this for three people or less. 1. Bring a heavily salted pot of water to boil for ravioli. Wash asparagus. Snap off and discard rough ends. Chop into half inch pieces. Press the garlic through a garlic press or finely mince. 2. In a large skillet warm the olive oil over medium high heat. Add the asparagus, garlic, salt, pepper, and red pepper flakes. Cook stirring somewhat often until asparagus is tender, usually less than 5 minutes. Then turn off the heat. 3. Add the asparagus mixture to a food processor and puree scraping sides as needed. Add the Parmesan and pulse to combine. Then with the food processor running, drizzle in the heavy cream. Set aside but don’t remove from the food processor. 4. Cook ravioli according to package directions. Near the end of cooking time reserve ½ cup of the pasta water. Strain the ravioli and place them back in the skillet. Turn the food processor back on and drizzle in some of the pasta water until the mixture looks like a nice sauce consistency. 5. Add half of the sauce for one package of ravioli or the entire batch for two packages. Warm the sauce and ravioli together over medium heat until warmed through. Salt & pepper to taste is needed and serve immediately with more Parmesan cheese for garnish. 6. Freeze any leftover sauce for an easy dinner later. questo piatto è superlativo!! che buono!!! ciao! Happy Saint Patrick's Day! This is a wonderful dish with the perfect shade of green to mark this holiday. Girl, I can't blame you for wanting to ride your bike, and have your hair running freely in the wind. It's must be so nice! You enjoy your bike girlfriend! Happy St.Patrick's day to you too !! Thanks for sharing your festive recipe, Laura ! Oh the ravioli looks so beautiful and delicious! The cream sauce sounds really good! just saw this on my flickr stream... and i had to jump over here and say YUM!! This is perfect for St. Paddy's Day! I love asparagus(have some right now), and this recipe sounds delicious!!! I'll have to try it for sure! Laura, For years I used to ride my bike 10+ miles a day/6 days a week...I really need to get back into that habit! Good for you! I like the way you think. I'd much rather have this than corned beef and cabbage. Everyone needs to act like a kid every once in a while! The recipe looks delicious! I think it is fantastic that you are enjoying being outside and riding your bike!! Don't feel bad about updating your blog if you're doing something so good for you. I wish I had more of a desire to ride my bike. In fact, I was thinking that exact thing earlier today. The dish of ravioli looks yummy!! I love that you used asparagus to make it green. Happy St. Patrick's Day! Great pasta. Enjoy the ride. OK, this is getting scary! Guess what this weeks BSI is? Asparagus! Please submit this fabulous recipe to Natasha: http://www.fivestarfoodie.com/2010/03/bsi-and-asparagus-fettuccine-with-meyer.html And it's also funny that you made Italian for St. Patty's day b/c so did I! A big pan of cheesey lasagna with buttery garlic bread. Followed by mint chocolate chip ice cream so that kind of counts since it's green, right? Just like your pasta! Keep riding that bike, girl--there's nothing wrong with taking advantage of nice spring weather! I love it. These look so good! I like the Asparagus Cream Sauce because while I may not be able to find asparagus ravioli, I could definitely make the sauce with some other pasta. A great variation to pasta - thanks for sharing! Green enough to not get pinched too despite the Italian dish! I love the idea of the asparagus cream sauce, how wonderful! Thank so much for sending it in for BSI! Yum, love the sauce idea! I'm with you about getting oustide...I sold my bike but I've been getting out to the trails and my legs hurt wicked bad. What a nice dish. Asparagus is always delicious, even better when you add cream. Enjoy your bike ride. How delicious! 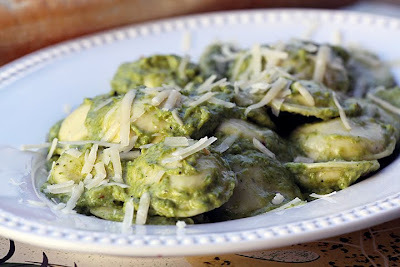 This is definitely the perfect St. Patty's Day meal for me, considering how much I love pasta! And you're making me want to buy a bike. I haven't ridden a bike in years! This looks so freaking delicious I am now looking at my salad lunch with disgust. I have some fresh asparagus calling out to your recipe. I do wish I could come and ride with you! Enjoy the good weather while you have it. Jealous! I have never seen asparagus ravioli in these parts, but I think I could make do with cheese ravioli and make extra sauce. Great idea! This dish not only says flavorful and delicious, and Happy St. Patrick's Day but, it screams spring and I love it. It's great to know that it is the time of year to enjoy bike riding. this looks so yummy! Great st paddy dish!! Happy St. Patrick's Day. I love the combination of Irish & Italian. Years ago we used to eat at a restaurant in Houston which was an Italian Bistro with an Irish Pub. It was called Birraporettis or something similar. I loved the concept. Bravo for your choice. I would love this dish. Happy St Patrick's day to you too! Wonderful way to celebrate - even if it is Italian - I am sure the Irish would forgive you as it looks delicious! BTW, I saw your pic on BSI asparagus and gave a little squeal--Dennis can attest. :) It's nice seeing people I recognize on other sites. I love your fresh, simple, original recipe. Stuffed pasta is always delicious to me :). Glad you're letting your inner child come out to play. We all need that from time to time. Ravioli is one of my favorite types of pasta and I love this asparagus cream sauce! I'm definitely going to have to give it a go when the next asparagus sale hits. Have fun on your bike! My little kid guilty pleasure is roller blading. Also fun! Nice way to enjoy some asparagus! I like to make a pesto with asparagus that also goes well on pasta. Oh my gosh - this sounds amazing!!! I don't have a Safeway around here, so I just used plain cheese ravioli. I think the only thing I would do different next time is add some frozen peas to the pasta, just to add a little more flavor and texture (I'd leave the peas whole). Thanks again for such a great website! Katie peas are a great idea! And so was the half and half.